I strained my shoulder the other night breaking up a bar fight. Normally, we have security when drunken customers switch over to the dark side but none of them happened to be around at the time. 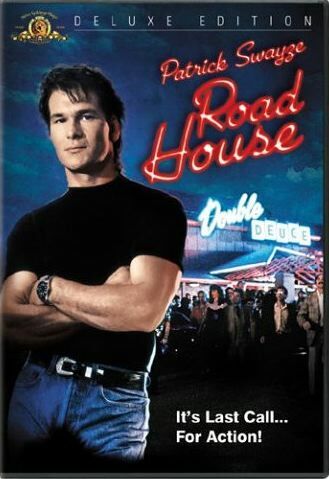 Besides, I’ve seen Roadhouse like forty times, so I’m good. At 44 years of age, I should probably give up trying to step in the middle of things. Chalk it up to natural instinct. Despite the bum shoulder, however, I won’t be missing any playing time. The same cannot be said for Derek Jeter and Ray Lewis, who both recently sustained season-ending injuries, Lewis with a torn triceps and Jeter with a broken ankle. Both men are their teams’ emotional leaders, both are first ballot Hall-of-Famers and both can now be found in the training room nursing their injuries, their teams’ chances of success without them dwindled considerably, if not out the window altogether. Not only have the Ravens and Yankees been dealt huge blows with these two out, but so have sports fans everywhere as both Lewis and Jeter are among the most enjoyable players in their respective sports to watch and that’s coming from a life-long Yankee-hater. As expected, ESPN has already begun eulogizing their careers, asking pointless questions such as “Which player is more of a loss to his team,” as if that’s something one can measure but to quote Derek Zoolander, I’m not a good eugoogolizer. If it’s one thing I know from watching these two over the years, it’s that they’ll both be back. At 38, Jeter led the league in hits this year (216). He ranks 11th all-time in that category and if he repeats that same success next year, he’ll land himself in the top five behind only Pete Rose, Ty Cobb, Hank Aaron and Stan Musial. Not bad company if you can get it. Lewis, 37, is one of the most feared linebackers of all-time. Speaking of the record books, Lewis is second all-time in takeaways (interceptions plus fumble recoveries) with 51, two behind Jack Ham. He’s already got one Super Bowl trophy and the game’s MVP award. Rest assured no torn triceps muscle will keep him from wanting to win another. In an era where athletes jump ship for the next dollar, Jeter and Lewis are anomalies, both having played for their same teams since 1996. Both have nearly single-handedly kept their teams competitive as long as they’ve been in the league. In fact, the similarities are such that it’s almost eerie they got injured in the same week. Both the Yankees and Ravens will now look to recover, Jeter and Lewis-less; losing guys like these both on and off the field will be no easy hurdle. The Yankees have already dropped two home games to Detroit with Justin Verlander and Matt Scherzer looming and the Ravens, while still solid defensively and 5-1 atop the AFC North, have an uphill climb to get to the Super Bowl without Ray Ray barking out assignments on the field. So fret not, Yankees and Ravens fans. Derek and Ray will be back before you know it, if only to plan their retirement tours. While their careers are both certainly on the downslope, they’ll still always be a factor as long as they’re wearing their purple and pinstripes. And if either of them chooses not to return, we can always take comfort that we saw the best of the best play the game the way it’s supposed to be played. Now, if you’ll excuse me, I have to get back to my ice pack. This entry was posted in Diamond, Featured, Life of Sports Chump, Pigskin and tagged Baltimore Ravens, Derek Jeter, New York Yankees, Ray Lewis, Roadhouse, Zoolander by Chris Humpherys. Bookmark the permalink. 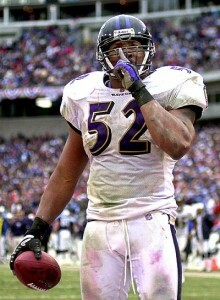 I love NFL ad , where the little girl asks Ray Lewis ” do you like my dress ” ? I guess Ray’ll be spending more time , helping the wife around the house for the rest of the season , if she chooses not to allow him out of the house . Jeter will spend his time updating his Rolodex and smart phone with the digits of the chics he’s laid the pipe to , and the ones who are still available for his renowned plumbing services . He also has his own 1-800 number . 1-800 WANNA BANG . Shoot, when I saw the Road House graphic, I thought sure you were gonna tell us how you broke up that fight by yanking someone’s ticker outta their chest 🙂 I will play devil’s advocate and predict Rayray is done and Jeets will be unable to shake off his lameness and retire before the end of Spring Training ’13. Ray’s come a long way, Al. It wasn’t all that long ago, towards the beginning of his career, where we were all ready to convict him for being outside the night club where the shootings went down. Now, he’s one of the most revered players in the game. I do have a hankerin’ to watch that flick now, Yaz. And I disagree with you. I think they both come back. I’ll even wager a drink on it for each. Just please, no bar fights. Wager accepted…if each play again in a game that counts, you win; otherwise, I will toast those two Vandy dudes who dropped balls in the end zone…the center bar at the Hard Rock may be safer. I had intended on making my annual trek to the Ville this weekend, Yaz, to see Coach Mus handle the Ol’ Ball Coach but alas, bar brawl duty calls. I’m gunning for Cal Ripken’s iron man streak. Well he (Lewis) worked his way out of that incident with his selective memory as to what went down . He does an incredible job concerning at risk youth in Baltimore , here in Polk County and also in the greater Miami area . But one of the things also , is that he commands the respect not only of his teammates but also by many of his peers across the NFL . I’m no conspiracy theorist but if the evidence that Goodell has , concerning the four players involved in the Saints’ bounty scandal should suddenly go missing like several documents from the Watergate Building . Then some questions will have to be directly answered by the commissioner . In a pretrial hearing , and the judge has asked for all evidence to be turned over to him to view. Goodell can’t use the dog ate my homework ruse or that it was lost by the courier , can he ? You’re Dalton? I thought you’d be bigger. And I’ve shaved off the mullet, even though it came in handy picking up chicks. You think Ray Ray comes back next year? I don’t see why he wouldn’t, right? Sorry about the shoulder brother. I’ve injured my left one so many times that I can predict when it’s going to rain. May I suggest three little words that can stop most barroom brawls. “The shotgun’s loaded”. Ray Ray may have lost a few steps over the years, but you’ve got to be impressed with how Jeter has resurrected himself as of late. Unfortunately I’m not sure he could have saved the Yankees this season. Oh ya…hope your shoulder injury doesn’t damage the golf game. Torn pectoral muscle ? Anything is possible . I think he will be back next season and the same too with Jeter . If a picture could paint a thousand words , then the still frame of A Rod sitting in the dugout last night as the Tigers were beating the Yankees like a wicked stepchild , offered us hope don’t you think that the player’s time in NYC will soon come to past ? He’s still owed over $160 million on his existing contract , but somehow I think that the front office will still retain his services ! No one wants part of A Rod at present, not with his baggage and the fact , that he barely turns up to play with any real zeal. He is not even the best player on the Yankees’ roster and that’s saying a lot given his $30 annual salary . You were saying that Lance Armstrong could withstand the public scrutiny , even with the public outrage and the issues that now surrounds his charitable foundation ? Well now that Nike has dumped his a#s , what happens now ? Nike is a visible high profiled corporate entity , and if they’re prepared to do that now . Then who will be next amongst his and the foundation’s most visible sponsors ? No one has yet suggested why it is that Armstrong chose not to go after former teammate Tyler Hamilton legally through the legal system but yet fans rather stupidly I might add , are stating that this was all hate mongering on the part of USADA (US Anti Doping Agency). Hamilton in a sworn affidavit and subpoenaed testimony stated what took place concerning he and Armstrong’s use of PED’s EPO and a slew of other banned substances . Selective memory on the part of Armstrong and his former associate Johan Bruyneel, who himself has been suspended several times by the sport’s governing body over the past five years . Ignorance is bliss amongst the fans who are still in support of Armstrong without ever once looking at many of the details . Nike dumps Lance Armstrong but who’s lying now ? Nike dumped Lance Armstrong today—but did they make the right decision? The sportswear titan claimed “seemingly insurmountable evidence” that Armstrong participation in doping and ‘misled’ the apparel and footwear giant. Concurrently, Armstrong resigned his chairman position at “Livestrong,” the cancer charity that he founded. Now, there’s a lot of proof that Armstrong engaged in doping and deception (see, for example, the 1000 page tale of nastiness released last week by US-anti-doping officials), and that certainly justifies Nike’s position, but there are still plenty of big picture issues worth considering. For starters, what do we mean by performance-enhancing? According to the World Anti-Doping Code, three substance categories govern the chemistry of cheating—1) It has the potential to enhance or enhances sport performance 2) It represents a potential or actual health risk 3) It is contrary to the spirit of sport—with a score of two-out-of-three being enough to earn a drug a place on the dreaded Prohibited List. With Armstrong having resigned his position with the foundation and now taking a back seat , you will now see a gradual decline in their fundraising on a national basis , as he was main spokesperson and visible face of the Lance Armstrong Foundation. So you tell me how this won’t affect the organization as of now ? Hey Chris, this might be a weird question for you. Do you post on FB under the name James Ryder? It will make more sense after further explanation if you have no idea what I’m talking about. I think we both know I’m a lover, not a fighter. And miss out on all the fun? Oh wait, it is fun watching them writhe and wriggle, isn’t it? When I first heard Jeter led the league in hits, I couldn’t believe it. And he’s banging supermodels. Gives hope to us old guys. If Nike’s dumped Old Lance, then you know they know what’s up. Listen, I never claimed to believe Lance didn’t “cheat.” I just didn’t care. I’m sorry to say I have no idea who James Ryder is but if he’s spreading the SportsChump gospel on his Facebook page, then more power to him. Be sure to thank him for me. It was only a matter of time before Nike would come to their damn senses . Now everyone of Armstrong’s major corporate sponsors will follow suit and a number of them may well seek recourse legally and sue the former cyclist. His estimated $70 million fortune will take a serious hit . Your thoughts on Cashman’s denial that he’s now shopping A Rod and the remainder of his $275 million — contract ? Apparently Dave Wirth of Tampa’s WTSP (News Channel 10) reported that the Yankees’ general manager had been in contact with opposite number , Michael Hill of the Miami Marlins about a possible trade . Apparently the alleged deal would mean the Yankees taking Heath Bell . The Marlins are still snickering and hiding behind the veil of secrecy not only about finances but also concerning the ongoing stadium fiasco . And now they want to add A Rod into that volatile mix ? What a joke ! The only thing that’s worthwhile coming out of this , is the very fact that it shows that baseball is still in a mess from an economical standpoint ! I’ll say this for Jerry Jones , but not a day goes by when he doesn’t supply the public with an asinine sound byte . Gotta love the guy for his goofiness . LOL,LOL,LOL !!! Leandro Barbosa??? How does that Celtic magician Danny Ainge find these gems just before the season starts? Whenever Nike pulls the plug on someone, that’s like the death knell, or knoll, I always forget which is correct. So he’s stepped down from Livestrong also, huh? Was that in association with Nike? I thought that was his foundation. Didn’t the Miami Marlins just dump a whole bunch of salary? That’s their M.O. these days. Sign big name players then cut them? Should be an interesting off-season in the Apple as, rest assured, A-Rod’s name won’t be the only one discussed when it comes to adjusting that roster. And I didn’t hear that Jerry Jones soundbite. I’ll be over late to check it out. Was it like anything Romney was spewing out during his second debate? I like the Barbosa signing, and some of your other off-season acquisitions, but I still think they’ll need an eff-load more if they’re gonna take down the Heat in a seven-game series. Who are you and why are you asking a number of odd questions? Everyone knows Ray Lewis is a monster on the field and the man has a heart the size of our continent, but when your body doesn’t agree with your mind anymore, there’s no going back. Rumors state that Lewis is planning for a comeback, but we wouldn’t be surprised if this was his last season. It’s tough to say at this point. 39 is old for an NFLer, particularly one who plays his position with such intensity. I’m not sure what his contract status is but if I were a betting man, which I am, I’d put money on the fact that he comes back.